These are the most common bearing type with a wide range of applications. Radial bearings are made with very high levels of precision and used in applications where rotational performance and low torque is necessary, but load is a secondary issue. Deep-groove bearings however do have higher load ratings for their size than shallow-groove ball bearings, but are also less tolerant of misalignment. Ceramic hybrid ball bearings use ceramic balls in place of steel balls and are constructed with steel inner and outer rings. Using ceramic balls that can weigh up to 40% less than steel balls these bearings reduce centrifugal loading and skidding. This allows hybrid ceramic bearings to operate up to 50% faster than conventional metal bearings. 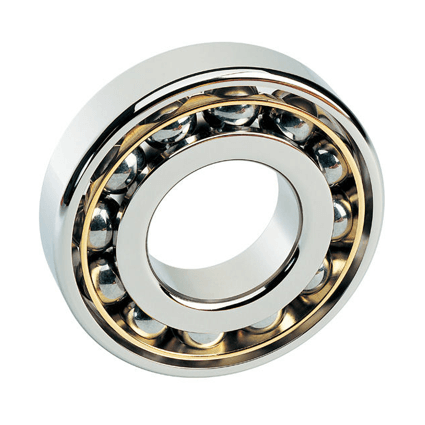 The lighter balls in this type of assembly allow the bearing to spin faster, using less energy to maintain speed.